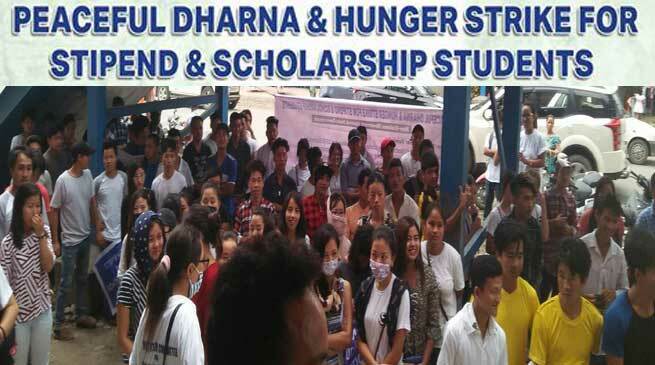 Joint Interim Committee (JIC) for Stipend & Scholarship 2017 organised Dharana in front Director of tribal Affair office Naharlaung today, Demanding immediately release of the pending Scholarship money of the students, releasing of Stipend & Scholarship from new academic session and Enhancement of the Stipend amount the Students. JIC chairman Hillang Nima said that due to pending or non pay of Stipend & Scholarship amount to the students of Arunachal Pradesh, students are facing so many problems , especially poor students studying in the capital complex and scholarship colleges & universities outside the state are waiting for the scholarship, so that they can pay their Rent, Hostel Fee, Mess Fee, Tuitions Fee, Semester Fee Etc. He also inform that MOU between JIC and state government representative has expired two months before regarding releasing of Stipend & Scholarship but there is no response from government. He also informs that presently 22564 post matric and 2,595 pre- matric students is still remain to pay. JIC also demanded give a permanent month for the releasing of Stipend & Scholarship from new academic session. and Enhance the Stipend amount from Rs. 16,400 to Rs. 30,000 from the new academic session. Director of tribal Affair Yumlam Kaha, said that the national scholarship is totally central government policy, and funds are also released from center , if central government could not released fund, then state government or department cannot do anything . Due communication gap with ministry of tribal is reason delaying in the release of fund from center and after meeting with secretary and under secretary of ministry of tribal affairs 7th June last at Delhi, the matter was clarify now central government is ready to released require fund for state and they also assured that within two weeks ministry of tribal affairs will be released fund and whenever fund received from central government we will distribute to all beneficiary students through direct benefit transfer( DBT) system, Kaha added. Clarifying the doubts of students he director kaha said central government released Rs 2.80 lakh for the session for 2017 – 2018 , but center has yet to released sessions of 2016- 17 of scholarship amount. Later on director Kaha appeal the student community to call off the dharna, and assured that whenever central government released required amount we will release and he also appeal the central government to release required amount as soon as possible.